The intent of the Before’n’After Files is to give more insight into the training, nutrition and supplementation of our clients Before’n’After successes. This time it’s Florian Raus’s 11-month transformation in which he lost 14,8% body fat and over 17kg on the scale. Foods are rotated daily, ie. he would have trout instead of beef patties for breakfast, chicken instead of salmon for lunch and turkey instead of chicken for diner. The vegetables are also rotated every day. His training program was changed every 6 workouts which is every 3 weeks since he trained 4 times per week on an Upper/Lower split. All the Best with your own Before’n’After Transformation! 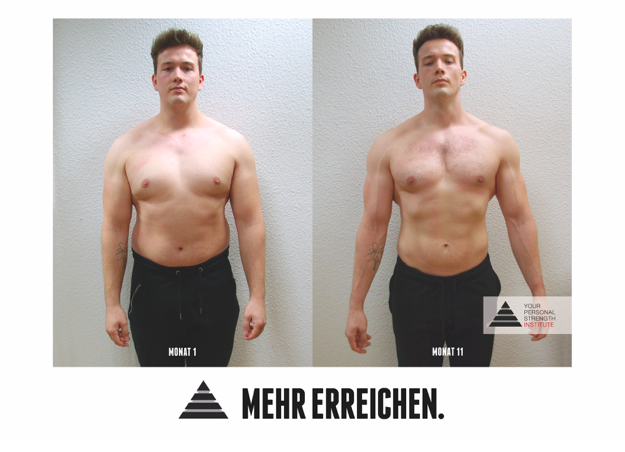 Picture: Florian’s Transformation in pictures.